Filichia Features: Start Spreading the Newsies JR.
“We call it ‘The show that has a Pulitzer,” said Drew Cohen. The president of Music Theatre International is extraordinarily adept at keeping a straight face when he delivers a joke. If you didn’t know Cohen, you’d automatically infer that he’s telling the 100% unvarnished truth. Not quite. Yes, Newsies: The Musical does indeed have a Pulitzer, but not in the sense that it won that famous prize administered by Columbia University. No, Newsies’ Pulitzer is Joseph Pulitzer (1847-1911), the newspaper publisher who left part of his fortune to endow 24 annual awards. If that makes you believe Pulitzer was a beneficent hero, well, then you haven’t seen Newsies. The story begins in 1899. As if “Big Joey” isn’t making enough money from his New York World and St. Louis Post-Dispatch, he decides to charge his newspaper deliverers – “Newsies” -- a bit more for the papers they try to sell. “New day, new price” is the euphemistic way the vendor puts it. To the Newsies, however, the rise in price seems unfair, so they go on strike under the auspices of thrust-into-leadership Jack Kelly. So did the stage version of Newsies, which got eight 2012 Tony nominations, captured two (for Best Score and Best Choreography), ran over 1,000 performances and grossed over $100 million. Who’d have thought this even a remote possibility 20 years earlier, when the $15 million film on which the stage musical is based took in less than $3 million. Bless Alan Menken and Jack Feldman, the providers of the film score, for writing some new and dynamic songs. Hooray for Harvey Fierstein for penning a much improved script with a fresh slant: Bryan Denton, the newspaper reporter covering the strike, became Katherine Plumber. Newsies isn’t just entertaining; it contains a vital message. Pulitzer tries to break up the strike by seducing Jack into taking a job with him in the time-honored divide-and-conquer gambit. Jack is indeed tempted but Fierstein carefully has him say after a grueling bloodbath, “No way I’m putting those kids back in danger.” This keeps us from simply seeing him – and hating him – as a potential turncoat. A family musical that includes plenty of roles for teens and tweens is a natural for Juniorization. 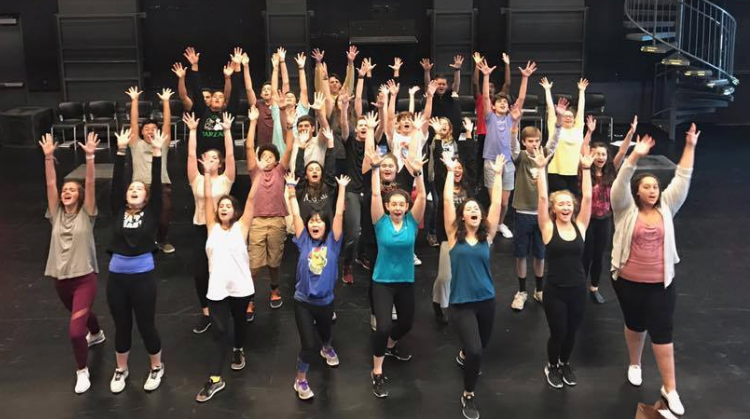 So last month, iTheatrics – which abridges Broadway musicals so that they can be performed by elementary, middle and high school students – floated a pilot of a less-than-an-hour-long version of Newsies JR. under the sharp direction of Marty Johnson. Many girls were in it -- as Newsies. In fact, iTheatrics showed it expected such casting, for “Give her (sic) a chance” was right there in the dialogue. Be aware, though, that you should not be planning your Newsies JR. any time soon. Years could pass before it’s honed to perfection and made available for production. But that’s a worse-case scenario. Even if we’re talking about 2019, I don’t have to tell you that time goes fast. Last month, those many dozens of young and limber legs were rarin’ to do Rebecca Marlowe’s choreography. Plenty of pugilistic pumps and ferocious looks were in evidence right from the opening song (“Carrying the Banner”). Theater kids are often mocked by boorish bullies, so here was a positive way for them to unleash their hostility. Fierstein’s original conception was to have Crutchie arrested at the end of Act One and not reappear until the curtain calls. When the show began its two-year national tour, Crutchie reappeared in the second act and was given a new song. As of now, “Letter from the Refuge” is included in the Junior version. All the student performers were letter-perfect with each song, probably because they’ve been listening to the original cast album for years. If your kids start getting familiar right now with the recording of Newsies, imagine how much more accomplished they’ll be when Newsies JR. becomes available.